Remember to always call 999 if you or someone else is in immediate danger. If you’ve been affected by domestic or sexual abuse or violence contact The Portal to find out more about the help, advice and support available. The Portal is a partnership of leading Sussex Domestic and Sexual Abuse Charities including Survivors’ Network.To contact The Portal, call Freephone 0300 323 9985 or email info@theportal.org.uk. •	Mankind, who offer support to men who have been sexual abused. Call 01273 911680. 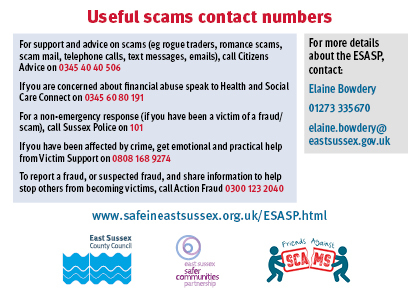 If you are concerned that you or someone you know about may be being abused, neglected or exploited, contact Adult Social Care. •	If the person is in immediate danger, contact the police on 999. •	Otherwise Phone: 0345 60 80 191, 8am to 8pm 7 days a week including bank holidays.